Due to the sad news today we are posting about Charles Rennie Mackintosh's beautiful design for the Glasgow School of Art as our building of the week. Glasgow School of Art, situated on a steep hill leading down to Sauchiehall Street, is one of the most distinctive Art Nouveau buildings in Glasgow, displaying a combination of decorative styles influenced by the Arts and Crafts movement of the late 19th century. The opening ceremony of the completed Glasgow School of Art took place on 15th December 1909, performed by Sir James Fleming (left), chairman of the Board of Governors. Sir James had been a pupil of the school a few years after it had been founded in 1840. At the ceremony Sir John Stirling Maxwell moved a vote of thanks to the architect, Mr Mackintosh, whom he said "had the real faculty of being able to adapt a building for the purpose for which it was really intended". He went on to say that the Glasgow School of Art "was a conspicuous success of that kind". Mackintosh acknowledged the compliment and on behalf of the contractors presented Sir James Fleming with a jewelled silver casket containing a decorative signed scroll. Charles Rennie Mackintosh's silverware was influenced by the work of the 'Wiener Werkstätte', designers and artisans of the Vienna Secession of which he was an honorary member. Charles Rennie Mackintosh had submitted his designs for the competition in 1896 and was successful in becoming the winning entrant when the result was announced in early 1897. Funding limitatations meant that the building was erected in stages between 1897 and 1909. Glasgow School of Art still demonstrates a freshness of style and presents a fascinating insight into turn of the century modernism. Founded in 1845 as the Glasgow Government School of Design, it changed its name to The Glasgow School of Art in 1853. It was first located at 12 Ingram Street and moved to the McLellan Galleries in 1869. 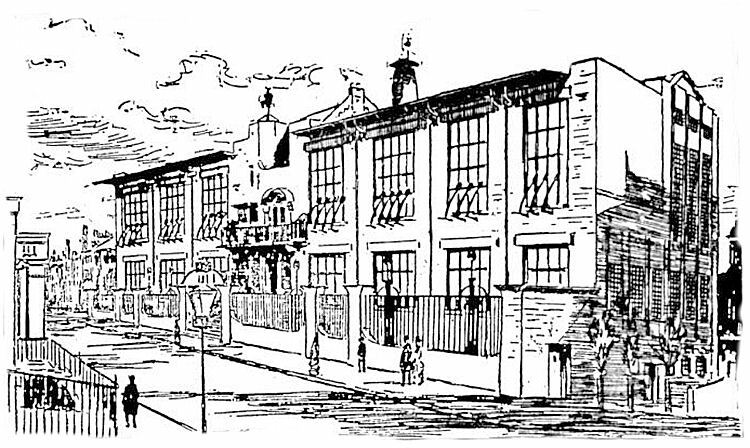 In 1897, work began on a new building to house the school on Renfrew Street. The building was designed by Charles Rennie Mackintosh, chosen for the commission by the school's director, Francis Newbery, who oversaw a period of expansion and fast-growing reputation. The first half of the building was completed in 1899 and the second half in 1909. Mackintosh lived most of his life in the city of Glasgow. Located on the banks of the River Clyde, during the Industrial Revolution, the city had one of the greatest production centres of heavy engineering and shipbuilding in the world. As the city grew and prospered, a faster response to the high demand for consumer goods and arts was necessary. Industrialized, mass-produced items started to gain popularity. 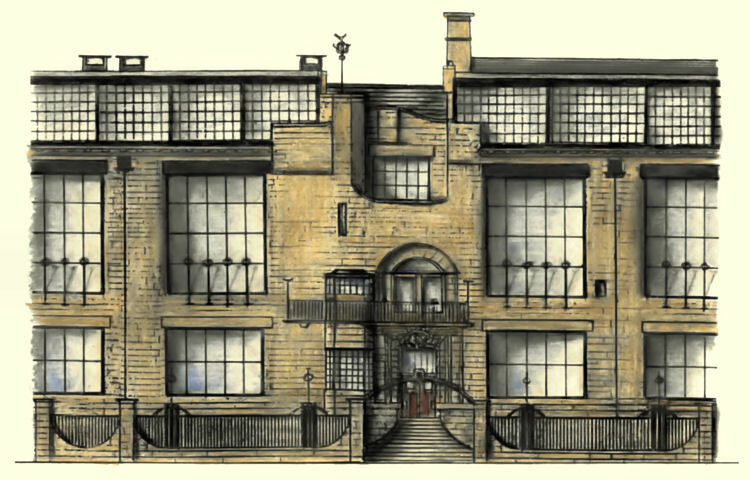 Along with the Industrial Revolution, Asian style and emerging modernist ideas also influenced Mackintosh's designs. When the Japanese isolationist regime softened, they opened themselves to globalisation resulting in notable Japanese influence around the world. Glasgow's link with the eastern country became particularly close with shipyards building at the River Clyde being exposed to Japanese navy and training engineers. Japanese design became more accessible and gained great popularity. In fact, it became so popular and so incessantly appropriated and reproduced by Western artists, that the Western World's fascination and preoccupation with Japanese art gave rise to the new term, Japonism or Japonisme. The school has produced most of Scotland's leading contemporary artists including, since 2005, 30% of Turner Prize nominees and four recent Turner Prize winners: Simon Starling in 2005, Richard Wright in 2009, Martin Boyce in 2011 and Duncan Campbell in 2014. The School of Architecture is highly rated by the architecture profession and the School of Design has been described by Design Week as "leaders in design education"